I came across this scene on my way back from a sub job one afternoon. There were half a dozen construction worker looking guys in hard hats and safety vest garb standing in the dirt of a lot that had been cleared at Morgan and N. Williams Streets. They were tree guys. 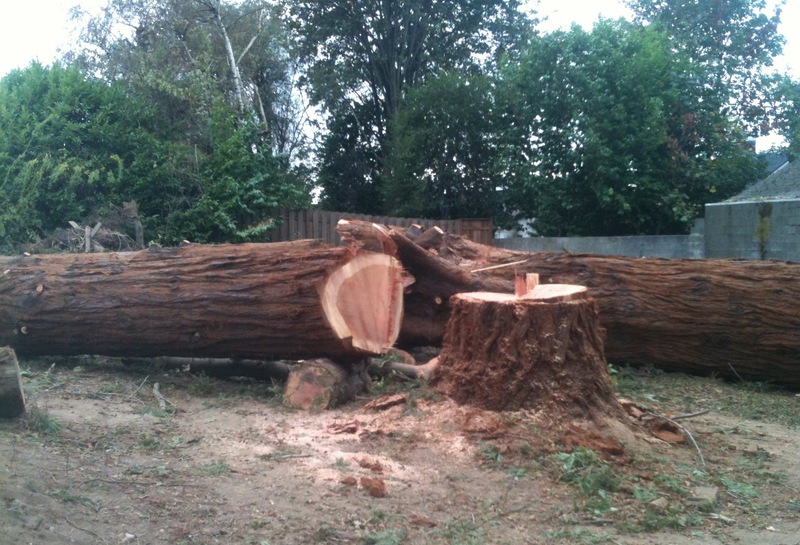 I looked over at the Redwood trees in the corner of the property and could see that some of the limbs had been cut off. Back on the ground a woman was shaken and yelling. I think it was directed at one of the men. Another woman was walking up the sidewalk. She seemed angry and involved in the scenario. The tree guys were milling around. One of them seemed to be laughing, not a hearty laugh, more like a reaction to an uncomfortable situation. And given this description it’s obvious how things ended. The trees were cut down. I rode past the scene on my bike.. I don’t know what else I could have done beyond stopping and watching so I didn’t stop. As I pedaled I noticed a man keeping a silent vigil on the sidewalk around the area. That seemed to be the problem: What could anyone do? The situation made me think of the Jim Morrison story about when he was a kid coming across a car crash with his family. A spoken word piece about the incident later appeared in the middle of the song Peace Frog. There was an intensity: Pissed off ladies, indifferent tree guys and soon to be dead trees. My regret was at least not taking a picture of the living trees. The tense situation caused me to flee. It’s possible I had seen some flyers in the neighborhood leading up to the time the trees were cut. There was some mention of organizing to save them. This didn’t happen. It had me thinking about the trees in SE that were saved. TV news coverage ate up the exploits of the man who climbed up the tree to stop the chop. 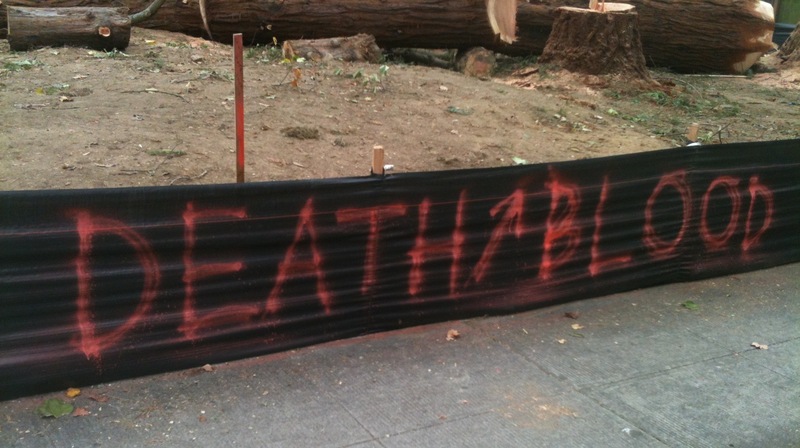 Surrounding neighbors banded together to put up a fight and bring awareness to the plight of the trees. A guy named Arthur Bradford seemed to be a spokesman for the protesters. I had heard that he performed a song about saving the trees at a Disjecta event. In the end it was Bradford’s connection to the world-famous co-creator of South Park who donated money that led to a deal with the developer to save the trees. I appreciated that for once something worked out. The SE trees were a statement that there can be victories for people and nature but Matt Stone can’t save all the trees. Who can save the trees? The Redwoods in the episode I witnessed were massive. I noticed this more after eyeing the giant stumps and logs splayed across the lot. It didn’t make sense that trees located on the corner of the property were cut. With minimal effort the design of a house or houses on the lot could have included these trees. It also seems senseless when you consider the older growth, healthy trees being removed. The Portland nickname of Stumptown is more of a quaint term of endearment than something to continue to live up to. I saw the remnants of the trees for what seemed like a couple of weeks hanging around after they had been cut. It seemed spiteful to remove the remains as soon as possible. 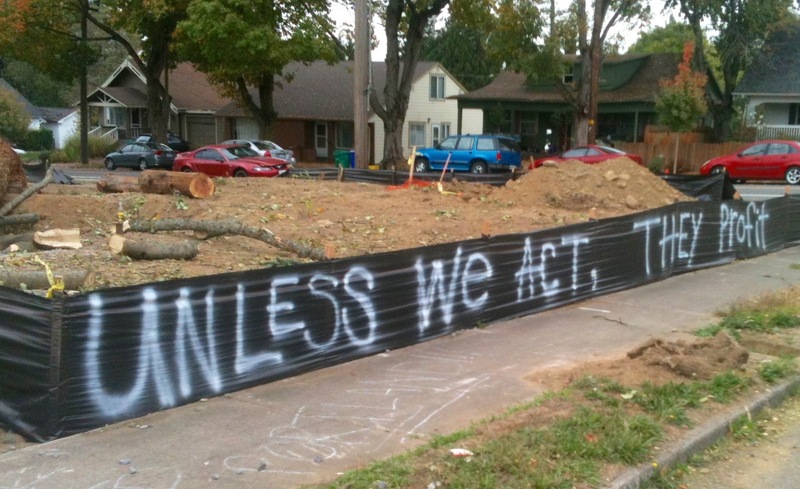 Spray painted messages appeared on the vinyl fencing around the property–anonymous expression of rage. 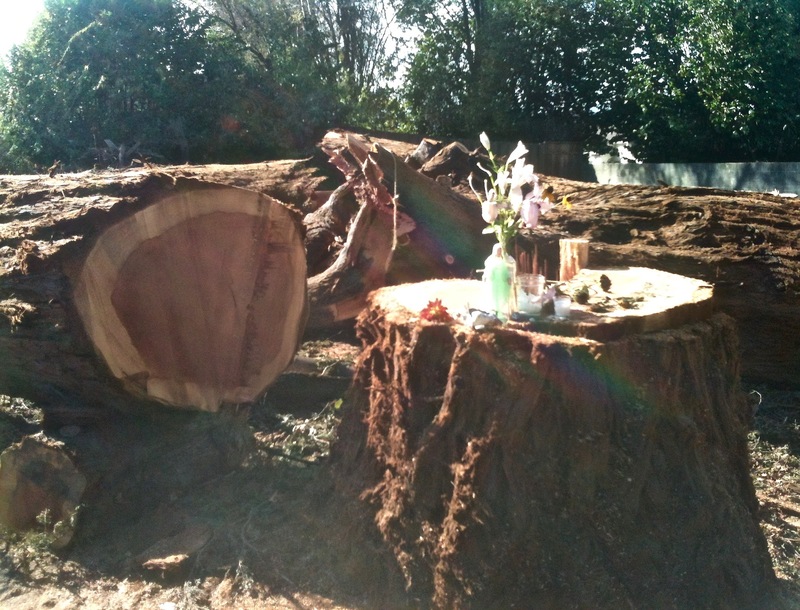 One tree stump became a makeshift altar. 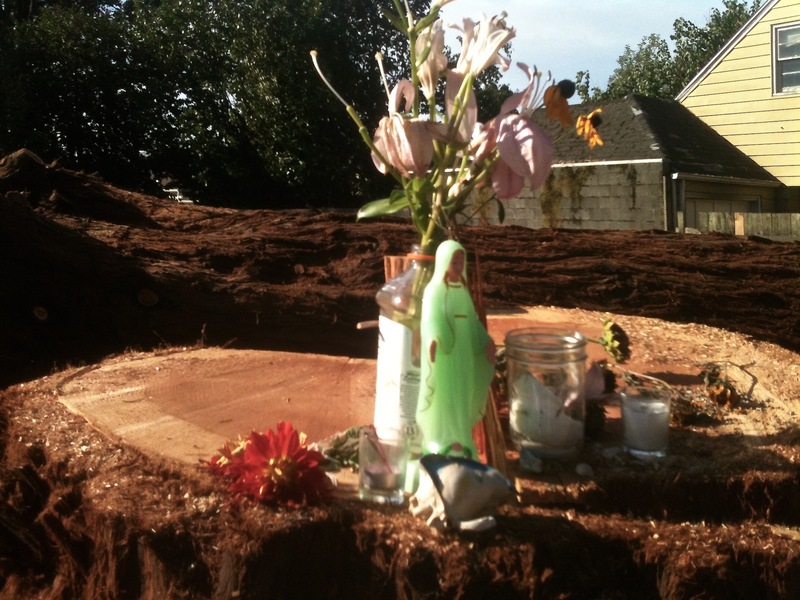 The messages seemed to be too little, too late but at least brought some attention to the loss of these trees. I can’t claim to be a tree hugger. But what I witnessed was disconcerting. I can explain it away as Portland growing pains but these are becoming more and more uncomfortable. There has to be a better solution to preserve noble, old trees. To compare the confrontation of the people with the tree cutters to that of the scene that Jim Morrison witnessed as a kid where people had died in a car crash is on the melodramatic side but there was an intensity, an underlying rage to that situation and others in Portland that have had people climbing trees and even up on the top of a roof to protest various demolitions. 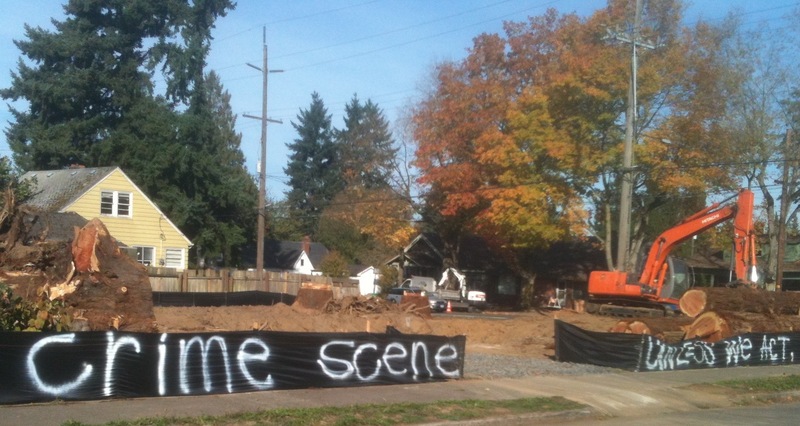 There was also such a doomed energy to what I saw, a helpless feeling in not knowing how to stop the changes to the character of Portland neighborhoods that are happening. I left the confrontation I witness thinking that something needed to be done to make changes that may protect threatened trees in the future. I wondered what mayoral candidate Ted Wheeler would do to save trees. I’d want that concern brought up at a future debate. The regulations now seem to favor developers paying minimal fees when they want to remove a tree. You’ll see me at an upcoming Mayor debate. I’ll have it looking like a Donald Trump rally. I’ll be the crazy standing up and asking, “What are you going to do about all these trees that are getting cut down?” I damn sure better get an answer. I think I can justify the use of the word “And” at the beginning of one of my sentences in this post. I know you taught your student Will Simmons of the Pittsburgh Orbit fame not to begin a sentence with the word “And.” He has explained to me that you also said that good writers break the rules. Let’s just say I’m choosing to breaking the rules here with a somewhat guilty conscience. P.S. I can imagine the title pun is a bit obnoxious. I couldn’t help myself. And I think you did a very good job on this fine, thought-provoking, and disconcerting post. I’m telling you the snapshot of that scene that is fried in my brain was traumatic. It was angry people and trees about to die. My usual bike commutes are almost always uneventful. Long live Mrs. Yuckmow!!!! !